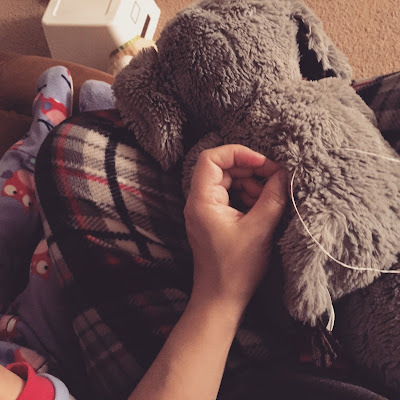 As I sewed him back together, I talked to Sophia about empathy and gentleness, that since Elephant had surgery, he will be sore and will hurt. I told her how she will need to be gentle with him and let him get lots of good rest tonight so he'll feel better tomorrow. Her capacity for understanding, compassion, and love amazes me. She still half-dragged him back to her bedroom, but she oh-so-gently cradled him in her tiny arms as she climbed into bed. She is the sweetest of souls. I talked to her about compassion and gentleness as a lesson for how to treat people, both others and herself. I'd spend the last two days in bed with a migraine headache, unable to attend to my husband or daughter. I'm so grateful my mother and step-father were able to come care for Sophia while I slept through it. I know my illness was a result of too many days without rest, too much stress, and throwing all my energy into the wrong things. The major source of stress in my life came from a relentless search to find a home to purchase. I've been living on Realtor.com and driving all over Northern Colorado for weeks trying to find something that would work for our little family. Friends, Colorado is not the place to buy a home right now. The market is in short supply and extremely expensive. Around 1,500 people are moving to this state per week, and they're buying up real estate like it will be gone tomorrow--because it will be. Houses are only on the market a couple of days before they're sold. And the rising cost is pushing middle-income families like ours out. I'd always had an ideal in my mind about what my life would look like in my mid-thirties, and I'm not there. I thought, for instance, that I'd have a series of books published and be living in a country house surrounded by well-manicured trees. I thought we'd have five children and a golden retriever. God has a plan of His own, though, and I'm trying to accept it. The real estate search became priority to me, overtaking the time my family needed from me, and affected my physical health. And so in the best interest of my family and the care of myself, I'm letting go. Sometimes treating ourselves well means letting go of things that temporarily seem important, and just giving them up to God. Sometimes it means accepting life as it is, and being okay if this is the best life has to offer. It is honorable to set your mind on a "better life" and work toward it. Nick and I've done that for most of our existence. However, at some point we must stop spinning our wheels and decide to be content, even if where we are now is the best it will ever be. It is not for us to know where God will have us in a year, or five years, or ten. I'm a planner, and it goes against my nature to just take it a day at a time and not plan out my life ahead of me. But I think in this season of life, it's the healthiest thing to do. I'm blessed with an absolutely stunningly handsome, hard-working, brilliant, loving husband who provides a life that allows me to raise my little girl every day. I have a fun, energetic, tender-hearted angel of a daughter who makes me laugh and wants nothing but love and to be like her daddy and me. I don't have a dream home, and my house has become a cluttered mess, but it's the place where my daughter was born. It's where she learned to crawl and took some of her first steps, and it's the only home she's ever known. I've driven myself crazy the past weeks and months striving for something "better," but God has humbled me and reminded me once again that everything I need is right here. So now I've got to refocus. Love on and care for my family. Allow myself rest and let go of the stress. I've been sore and hurt, and I need to be gentle on myself. Turn it back over to Jesus, and let Him carry my burden.